It looks like he was dumped after press and social media awareness. Too Hot To Handle. 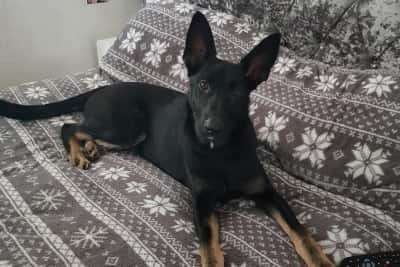 He was Stolen from #Glossop on Woolley Mill Lane, Woodhead by 3 men in a Black Saab who claimed to be dog trainers, SK13 area, North West on 14th January 2019. Milo has a skin condition that requires vet treatment. Dog owners plea for safe return of pup stolen by gang on Woodhead Pass. 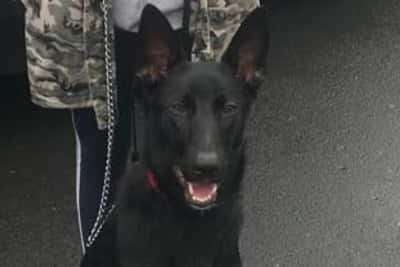 A dog owner has made an emotional plea for the safe return of a puppy allegedly stolen by a gang of men from the Woodhead Pass near Sheffield. Milo, a German Shepherd cross, was stolen at around 11pm on Monday January 14, by a gang of men who had purported to be dog trainers. His owner, Alana Bell, 28, of Manchester, had arranged to meet one of the men, after he replied to an advertisement for a trainer due to the 10-month-old’s behavioural issues after being rescued from a puppy farm where he had been abused leaving him scared of men. The man, who gave the name ‘Mark’ told Alana to travel towards Sheffield, as he was from Rotherham, and that he would let her know the address when she was close by. However, when she reached Woodhead Pass, she decided to call ‘Mark’, who conveniently said he was only five minutes away and the pair met in a lay by. Upon arrival a man – believed to be in his late 30’s to early 40’s – stepped out the car, followed by two other men leaving Alana fearing what would happen next. She said: “He kept stepping closer to me. The he just snatched Milo out my hand, and Milo was trying to get back to me. Milo is currently suffering from a skin condition, therefore needs to see a vet regularly, and suffers from separation anxiety. After the ordeal, ‘Mark’ rang Alana, thanking her for ‘the dog’. “In hindsight I feel stupid, I think why did I meet them,” Alana added. “I’ve got two young daughters and I’m keeping it from them. I just took them to school but they have been asking where Milo is. “I kept ringing the number, and asked my family too. His friend, who said he was the driver, rang me the next day and said he didn’t know it was going to happen. He offered me money, but I said no I want Milo back, just tell your friend to take him to the local vets.” Milo is currently micro-chipped, and was allegedly taken in a black D-reg Saab. “If they could drop him off at the vets, they’ll have my details or leave him somewhere I can get him. It would mean the world to me to get him back, he’s like my son,” Alana said. Anyone with information on Milo’s whereabouts should call Derbyshire police on 101.